Real friendships might be rare, but they are so valuable. If you find a person that understands you, your passions, and that can be there for you in good and bad, then you have found your friend soulmate. Heartwarming friendship tattoos are inspiring. There are so many things you can turn into ink and show how close you are with your best friend. Thinking about matching tattoos with your bestie? Search no more – you’re at the right place. Let your best friend be the X, and you be the O. 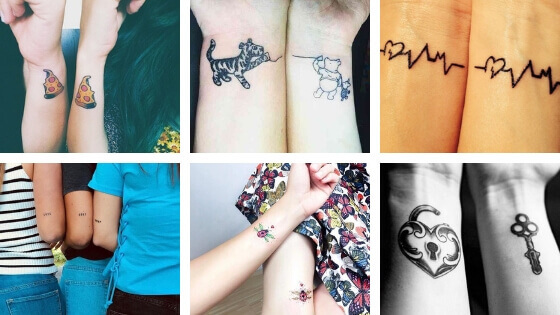 You will be complement forever with this minimalistic yet meaningful tattoos. Whether you are a group of two, three or four, you can always do a tattoo like this. Simple, yet it will mean a world to all of you. Fan or not it is hard that you haven’t seen just one episode of the tv show Friends. You can now do tattoos with the series logo to remind you of your favorite show or simply on your best friend. Do you like pizza? Not as much as your best friend do. To show your mutual love for this lovely food, you should do matchy tattoos on the wrists of your hands. If you have made some secret promise with your best friend and you tend to keep it between you, prove it. You can do a matchy tattoo with a pinky swear. If you want to prove that your heart is pounding only for your best friend, then you should do a tattoo like this. A lovely symbol will remind you of your friend all the time. Do you know those beautiful tattoos that are made of two halves that make one piece whole? Well, you can now opt for one – with your best friend and mandala. Pineapples are tasty, and also very often shown as a tattoo symbol. If you want to make it match with your friend, choose some nice place to put it on. Nothing can beat traveling with your best friend. If you are both globetrotters who adore traveling together, then do a matching tattoo to show it to the world. Fingers crossed that your friendship lasts forever. You can also make that promise by tattooing tiny hands with finger crossed. If you are looking for something meaningful yet minimalistic, this is the right tattoo for you. A small wishbone on the wrist of your hands will make you unique. While your best friend has a key tattoo, you have a heart with a keyhole. What does that mean? Only he/she knows the secrets of your heart. The foot is an amazing place to put your tattoo on. You can arrange matching Love tattoos with your friend and show them off this summer. These tattoos apply that your friendship will last no matter what comes to your way. Infinity tattoos are perfect for both girls and boys. Simple dots on your hand can make a significant change. It can connect you with your best friend even more if you opt to do a matching inking. Let your friendship crown be this lovely tattoo. This is perfect for woman-man friendships as well as for couples. Show off everybody how much you love avocado. It is not only tasty but also very photogenic for a tattoo. Convince your bestie to do a matching one. Do you and your best friend love animals? Then show it with tattoos like this. While one of you have a cat tattoo, the other can have a dog. If you are big fans of Harry Potter adventures, you can also show it through your tattoos. Match with your friend by inking your favorite characters on the back of your arm. If you were thinking of a unique way to do your matching friendship tattoo with your friend, then there is no better way than this. Two princesses for two real princesses! Constellation tattoo looks perfect on one person. However, it will look even better if you opt to do it matching with your friend. Make sure these constellations mean something personal to both of you. You can always choose a nice matching floral tattoo to go with. They can mean your friendship blooms all the time, while you can also wear it separately.